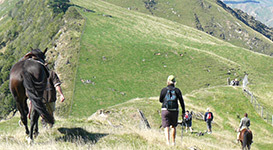 Experience three stunning and unique day walks - from $15 per person. Dinners are prepared and served on site using local produce.. This colonial shearer's quarters sleeps 6 - from $35pp per night. Simple, stylish and cozy, sleeps 8 - from $140 per night. Enjoy the Haurata experience, great for family getaways, walking holidays, self catering if preferred, a romantic escape or just to experience New Zealand. This diamond in the hills could be your next escape . . . Situated between Gisborne and Opotiki, Haurata is approximately 65km from Gisborne city and 24km east of Matawai village. 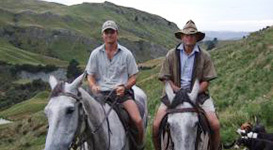 Experience Farm Stay Accommodation in Gisborne's stunning, rugged backcountry as you leave SH2 and weave through the unique bluffs and rock sculptures on the 13 kms up Makaretu Road to Haurata. Hosts Jane and Warwick Tombleson farm the land at Haurata alongside their main farm Aerial Station, which has been biologically farmed since 2007. Watch 'Riding High' a Hyundai Country Calendar episode that was filmed last year at Haurata. 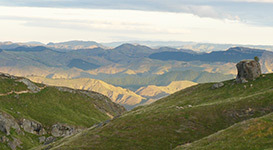 Fancy a Gisborne walking holiday . . . we have three stunning day walks, each with their own unique landscape and breath-taking views. What our visitors have to say. . .
"Our trip in NZ was great and wonderful and your place was one of the very best." "The accommodation was delightful and provided with plenty of interesting reading material." "This is the best walk of the five we have done."